Does Your Carpet really need it? There's always a time and a place for everything. When it comes to carpet cleaning, the question you have to ask yourself is what care does the manufacturer recommend your carpet requires? How often should you be cleaning it yourself and how frequently should you be calling in the experts. Because you definitely shouldn't need to steam clean your carpet regularly since it is a deep cleaning of a carpet that is generally recommended by experts to be required once every year and a half. 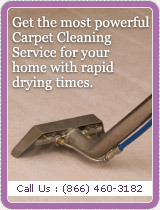 Steam carpet cleaning, as opposed to regular vacuuming of your carpets, does hold certain advantages. For instance, most oil and mud stains cannot be removed by regular vacuuming. Even a thorough wash of your carpet will not get certain oil and mud stains out. Only high pressured, dry or vapor based steam cleaning can dissolve these particles and thoroughly remove them from your carpets. It's important to remember that even though steam carpet cleaning is one of the best ways to clean your carpets, it should only be implemented once every year and a half or so as to not put an excessive toll on your carpets.